Just to be sure, are you following your blog from that Mastodon instance? Hmm, mind sharing what instance that’s on? I’ll take a look at the server logs to see if something went wrong. Changing usernames is largely unsupported in the fediverse, unfortunately. It’s basically like creating an entirely new account, where everyone needs to re-follow your new username to get your posts. This is an ActivityPub thing, not specifically a Write.as thing (though I will document this somewhere, so it’s clear). Can you try following your account again from Mastodon, ensuring your new username shows up, and seeing if that fixes things? 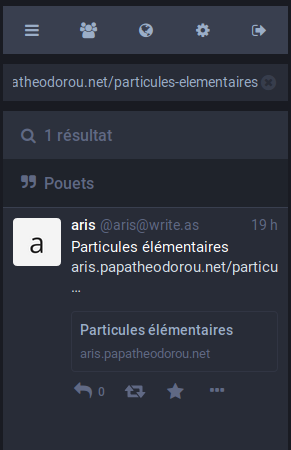 In fact I reverted to default Write.as ActivityPub ID/Adresse (@aris@aris.papatheodorou.net) for testing purpose, because my custom one (@blognotes@aris.papatheodorou.net) was not working at all. 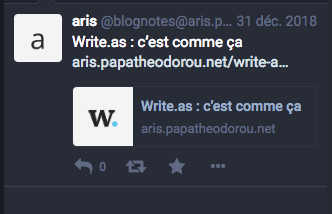 I also follow my blog from @aris@write.as. This grabbed the two preview posts… but not the new one. I will try in next days from an other Mastdon instance. 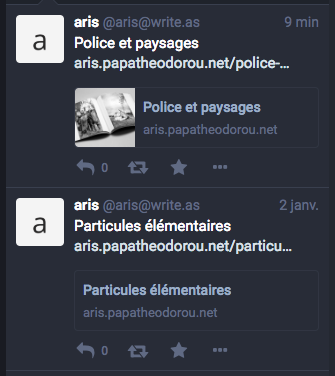 I’m not getting any federation from my blog to Mastodon… I have to manually search for all new posts in order to see them in Mastodon. I followed my blog right from the get go. I also use a custom domain. 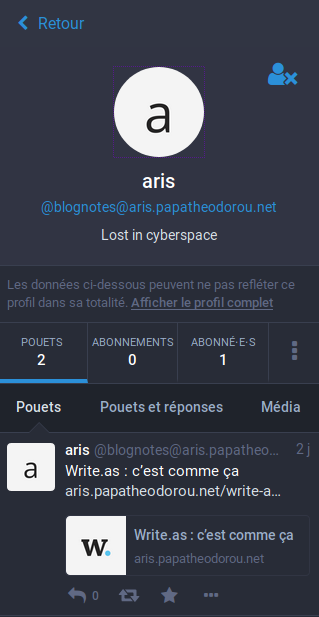 I also don’t see new followers in my Mastodon for my blog - the only one showing is myself, the next new follower is not showing. Some of this may be Mastodon rather than Write Freely…? Do you mind sharing your handle here or privately? I can take a quick look to see if something looks off. Mastodon doesn’t pull in the full information about followers – this is something we’d have to display in WF. @matt - did you shine any further light on federation issues I am having…? Is the point of Federation privacy or community? Being not technical, I’m not getting why I should or shouldn’t move forward with it. Thank you. Thanks for sending along the info. I didn’t find any issues with your instance, and indeed I followed the blog from my instance and received your most recent post automatically. Have you tried unfollowing / re-following your blog more recently? The point of it is mostly community. It’ll make the most sense for anyone who uses services like Mastodon, but you can also see how it works in this video. Thanks for getting back and testing from your end. I have this evening unfollowed and I will re-follow later. Just putting a post together that I will then see if it federates automatically. Thanks Matt. I finally figured it out. Is the community mostly within Write.as, or is it across other social platforms. That was my main confusion. Thank you, again. I can confirm that all is as it should be.